Betsan Corkhill is the founder of Stitchlinks, a non profit, community interest company set up in 2005. 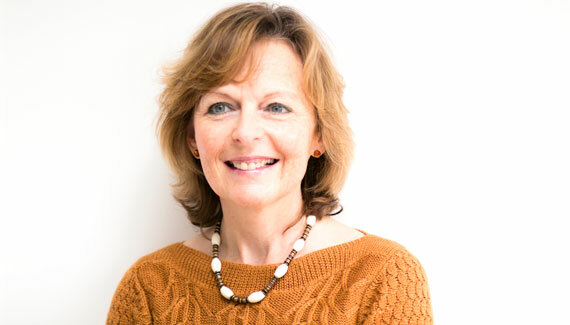 In the first of our knitting interview series, Betsan talks us through the therapeutic benefits of knitting and how the work she is doing is pioneering ways to help people address a wide range of issues and improve general wellbeing. Can you tell us more about the work that you are doing with Stitchlinks? Stitchlinks is a global support group for those who enjoy the therapeutic benefits of crafts particularly knitting. It is pioneering research into the benefits of knitting to develop Therapeutic Knitting as a tool for wellbeing. How is knitting used as a tool for wellbeing? Health and wellbeing is about so much more than isolated symptoms and medication – it’s about the whole person and their environment. Therapeutic Knitting can help people address a wide range of issues to improve general wellbeing. Stitchlinks is helping to raise awareness that health and wellbeing is about the whole person. If you’re fit and healthy Therapeutic Knitting can help you to manage the ups and downs of normal life. If you’re unwell it can complement your medical treatments to help you deal with the ‘other issues’ that influence how you respond to treatment or manage your symptoms. My work has shown that issues such as social isolation and loneliness; stress, worry, fear; lack of rewarding occupation; low self esteem and confidence; loss or enforced change in identity make a difference to whether you sink or swim! What inspired the idea for Stitchlinks? I was working as a senior physiotherapist and became frustrated at being caught up in a system which didn’t allow me to give my patients the time and treatment I felt they needed. This was particularly the case with people who suffered from long-term medical conditions. After much heart searching I left my profession and became a freelance production editor for a range of camera and computer magazines. I eventually ended up on a range of craft magazines. One of my jobs was to look after the letters pages. This entailed reading the large amount of letters which came into the office every day. About 98% of these talked about the therapeutic benefits of craft but in particular knitting. That was my ‘light-bulb’ moment – I realised I’d stumbled across something potentially very important. Something that could change the way we treat long-term medical conditions. I wondered whether knitting could be used as an activity from the arm chair which could act as a springboard to other activities – to motivate those people I saw on my community rounds, to bring them back into the world – that was my starting point. What are the therapeutic benefits of knitting? 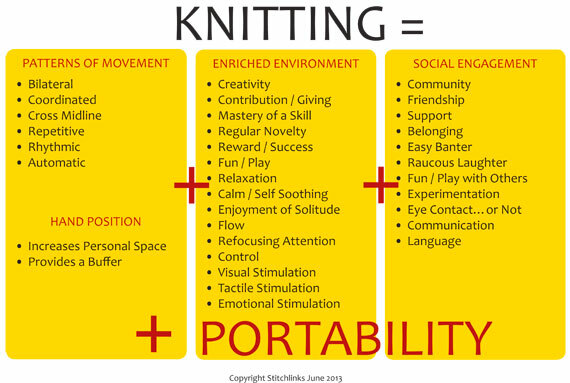 Below is the ‘Knitting Equation’ which summarises the benefits. When I showed this to a group of doctors recently one commented that if he was to design the perfect, holistic therapy he would have listed these issues. As a physiotherapist specialising in neurological conditions I have been intrigued by the movements of knitting and their potential effect on the brain. The work I’ve done so far strongly suggests that the bilateral, cross midline, rhythmic repetitive, automatic nature of the movements are important. For example, a high percentage of the narratives I’ve collected attribute the feeling of deep calm to the rhythmic nature of the movements. The state of mind reached is described as meditative-like even by people who regularly meditate. I carried out a survey of over 3,500 knitters with Cardiff University and we found the more frequently people knitted the calmer and happier they said they felt. 81% of respondents to our survey said the felt happier during and after knitting. 54% of respondents who were clinically depressed said knitting made them feel happy or very happy – that’s quite some achievement. What was your route into knitting? The work you’re doing focuses on the therapeutic benefits of knitting – what type of conditions can it be used to help with? Anyone could benefit from setting aside 20 minutes every day. Being able to ‘switch off’ for a short time every day gives the mind a break and is beneficial to wellbeing. Anyone can use knitting as a portable means of stress management. Use it on your commute to work or during your lunch break. It has been found that taking your mind off a problem you’ve been dwelling on and doing a relaxing creative activity will often help you to solve that problem – the solution will often just ‘spring’ to mind when the mind’s attention is focused elsewhere. long-term pain of all kinds, chronic fatigue and fibromyalgia. How can people actually get involved with the work that you’re doing? People can visit the website and join our forum to chat to others using crafts therapeutically across the world. We also have a free monthly newsletter if you want to keep up with our news and research. The website is also a rich source of information which is free to download and use so I would encourage people to talk to their doctors and healthcare clinicians about the work. If anyone wishes to start up a group, there is plenty of information on the Groups page of the website to help you and of course people can always email me directly. You sell knitting kits on your website too – are these patterns designed by yourself? Who are the people who inspire you in the knitting/crochet world? I suppose the people who inspire me the most are the people I know because I know the huge amount of hard work and commitment they’ve put into the success of their business. The first is Jeni Hewlett of Fyberspates – I first met her when she was a psychologist working at Cardiff University. Fyberspates was just a kitchen-based sideline – a dream. She started by dyeing each skein of yarn herself and has worked fantastically hard to create a company which now sells beautiful yarns around the world. Have you been able to see first-hand how the work you’re doing with Stitchlinks has made a difference? Any moments in particular that have stood out? Yes, there have been lots of moments ranging from emails from people who have changed their lives as a result of joining Stitchlinks through to experiences of the patients I treat. Unfortunately I can’t talk about individual cases because of confidentiality issues but experiences range from people who were agoraphobic being able to enjoy the company of others again, the curing of anxiety and panic attacks, and people who now live with a considerably better quality of life despite long-term pain or mental health issues. In some cases they have used knitting to come off or reduce medication. A Therapeutic Knitting group can literally be a lifeline for people as can finding out you’re not alone when you chat to others on the forum.